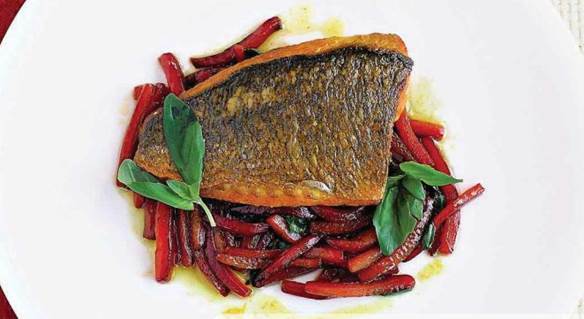 These smart recipes from top chef Gordon R. combine maximum flavor with minimum fuss for oodles of energy and a healthy body. 1. Trim the bream fillets to neaten and pull out any pin-bones with kitchen tweezers. ‘ Mix the olive oil and saffron strands together. wide dish. Add the fish fillets and toss - them well to coat. Grind over some pepper, cover with Clingfilm and leave them to ‘marinate in the fridge for 20 minutes. 2. To prepare the peppers, halve, co re and deseed, then cut into thin slices Heat the olive oil in a large frying pan or wok, add the peppers and stir-fry over a high heat for 2-3 minutes until they begin to soften. Season with salt and pepper and add the sugar and a small splash of wine vinegar, Allow to bubble for a minute until the vinegar has cooked down and the peppers are tender. Take off the heat and set aside; keep warm. 3. To cook the fish, heat a wide non-stick frying pan until hot. Season the bream fillets with salt and pepper and fry, ski n side down, for about 2 minutes until the skin is golden brown and crisp. Flip the fillets over and fry on the-other side for around a minute until the flesh is opaque. 4. Divide the peppers between warn plates and top with the bream fillets. Serve immediately, garnished with basil. 1. Remove the skin from the salmon and check carefully for pin-bones, pulling out any with kitchen tweezers. Place the fillets side by side in a shallow dish. 2. For the marinade, mix the ingredients together in a bowl, then pour over the salmon to coat. Cover with Clingfilm and leave the salmon to marinate in the fridge for 30 minutes to allow the flavors to permeate. 3. For the dressing, whisk together all the ingredients in a bowl and set aside. Heat the oven to 230°C/450°F/Gas Mark 8. Arrange the spinach leaves on individual plates and top with the radish slices. 4. Lift the salmon from the marinade and arrange it on a lightly oiled baking tray. Cook the salmon in the oven for around 4-6 minutes until it’s medium rare, basting it after 2 minutes. The fish should feel slightly springy when pressed. 5. 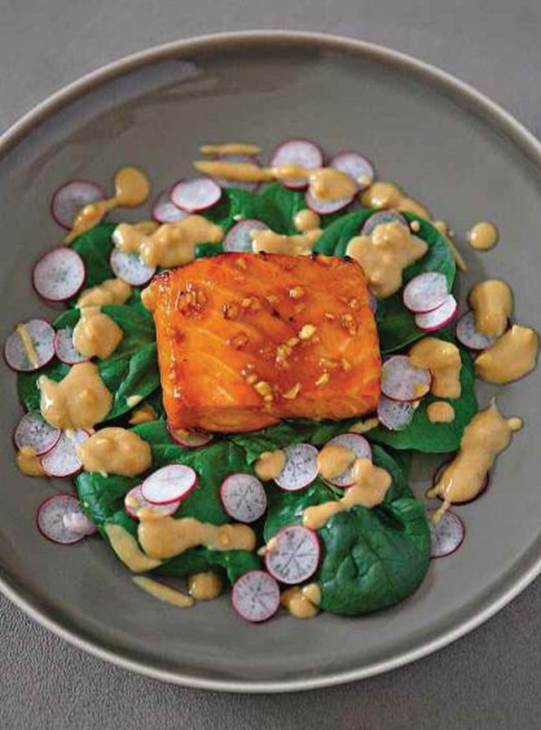 Place a salmon fillet in the middle of each plate and drizzle the ginger and tahini dressing over the salad to serve.